It's loud, it's raucous, and it's great fun. "Rock of Ages" has taken over The Colonial Theatre armed with a hefty dose of glitter and glam. The premise is pretty simple. Book writer Chris D'Arienzo has created the simplest of storylines -- boy meets girl -- and then slammed in appropriate rock hits to illustrate the plot and move things along. From Journey to Styx, REO Speedwagon, Night Ranger, Twisted Sister, Whitesnake, Pat Benatar and more, they're all on the set list. The place is the Sunset Strip. Rocker wannabe Drew is a shy guy who longs to stand in the spotlight at Dupree's Bourbon Club, becoming superstar "Wolfgang von Colt." In the meantime, he cleans the toilets. He meets Sherri, a small town beauty who's arrived in Hollywood looking for fame and fortune. They hit it off, but through an uncomfortable miscommunication, they take the "we're just friends" exit on the love highway. They wind up on separate tracks, although he never loses his infatuation for her. Meanwhile, his career takes a sharp left turn (he's forced into a hideous boy band) and hers takes a nose dive (she becomes a stripper). So when Drew and Sherri meet later, they're in much different places. Still, after some bumps in the road, love wins out. The subplot has a German developer trying to bulldoze The Strip. 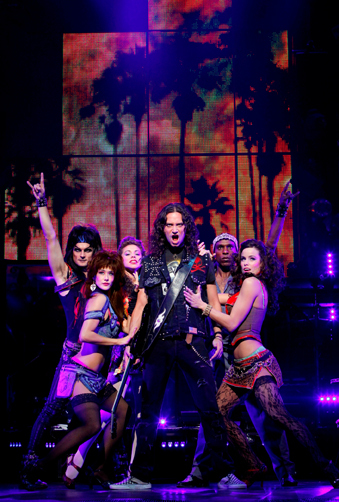 Protests abound -- always good for a rock musical -- but will heart win out over profits? Boston Conservatory grad and former "American Idol" guy Constantine Maroulis (at left) stars as Drew. He created the role on Broadway and was nominated for a Tony Award as Best Actor in a Musical. That alone is enough reason to get yourself a ticket because, these days, few actors who originate a role on Broadway willingly take their show on the road. But Maroulis has, and the crowds at The Colonial are all the better because of it. Aside from singing up a storm, Maroulis presents an endearing sketch of a guy who's incredibly shy and nerdy until he steps up to the microphone. Then his vocal cords throb with thunder. Throughout the show, it's evident that Maroulis is having a great time, and his enjoyment of just being there is infectious. He's also very funny. Which is another point. Despite the rock music foundation, "Rock of Ages" is actually very (very) funny. It never takes itself too seriously, working self-referential zings into the works. At the heart of a lot of the humor is Lonny (Patrick Lewallen), the Club's loony sound guy, who serves as our narrator, of sorts. Lewallen has an easy way about him, and armed with a runway of questionable T-shirts, he plays the role with a sly smile, constantly letting us know that the show is just one big spoof. As Sherri, Rebecca Faulkenberry is a blonde beauty with a scorching voice. As Stacee Jaxx, the burnt out rocker who got his start at Bourbon Club and agrees to play his farewell concert there, MiG Ayesa is a pro with an incredible sound. Also in top form are Casey Tuma as the strong-voiced gal-with-a-cause Regina, Nick Cordero as Dennis Dupree, the club's owner and Travis Walker as Franz, the comical pretty boy son of the nasty developer. And oh yeah -- the music. You'll hear everything from "Don't Stop Believing" to "Just Like Paradise," "I Want To Know What Love Is," "Hit Me With Your Best Shot," "We're Not Gonna Take It," "I Wanna Rock," "We Built This City," "Any Way You Want It," "Here I Go Again" and a lovely rendition of "Every Rose Has Its Thorn." It goes without saying that this probably isn't for the Rodgers & Hammerstein matinee ladies. But for the crowd waving their complimentary flashlights in the dark at The Colonial, it was heaven on earth. The performances drive the car, using the music as jet fuel. And throughout the night, there's enough flashy lighting effects to keep everyone semi-blinded. In the end, superstardom does not come for Drew. But is he successful? Absolutely. He just chooses to be a working musician who's also got a nice little family at home. As the show says, the dream you come in with ain't necessarily the dream you walk out with. But at "Rock of Ages," everybody walked out one step closer to nirvana. "Rock of Ages" is at the Colonial Theatre through October 17. For information, call 800-982-2787.